dance.net - My first solo dress, at 38 years old! (10131723) - Read article: Ballet, Jazz, Modern, Hip Hop, Tap, Irish, Disco, Twirling, Cheer: Photos, Chat, Games, Jobs, Events! My first solo dress, at 38 years old! Happy dance all over again! I didn't think I'd be able to bring it home today, (it was supposed to be a fitting) but the dressmaker told me to go shopping for a few hours then I picked up the finished product! It moves so nice! 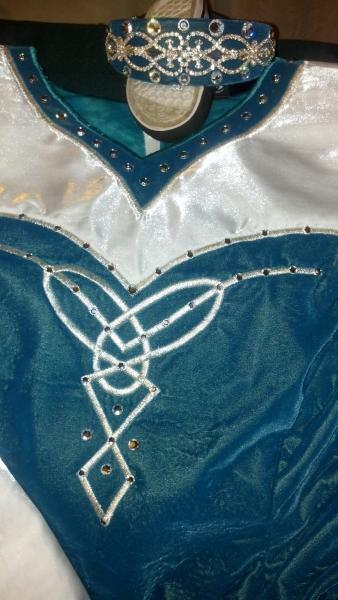 I love the knotwork and the stoning came out just right! Just enough sparkle to stand out, but not blind someone! 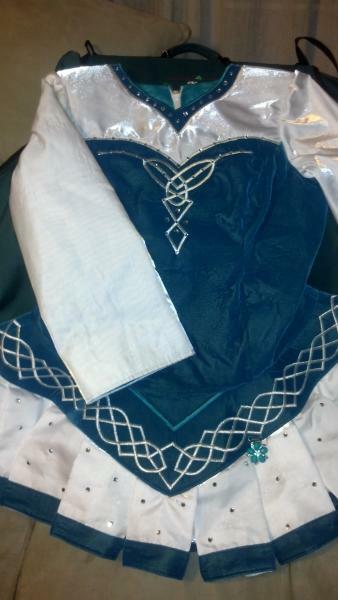 I have no idea when I'll be feising in it this year - our school's feis is the same weekend as my 20 year High School reunion. Perhaps one of the Syracuse feieanna or Finger Lakes - have to look closer at dates. It is enirely possible that, God and teachers willing, Oirachtas may be the first time I wear it on stage! By the way, did I use enough exclimation points? 21 Replies to My first solo dress, at 38 years old! re: My first solo dress, at 38 years old! Congratulations! Your dress is so pretty, and you look so happy in it! Hope it brings you lots of luck at your next feis. I hope you find a few that fit into your school; a dress that pretty needs to go dancing! Nice! Good luck dancing in it!!! Congrats to you! It's lovely and you look great! Happy dancing in it! Beautiful dress! I think there's a perfect amount of bling on it, and the color is simply beautiful. You look beautiful in it!! You look glowing in it! I love the flower number holder too; best of luck dancing in your new dress. I'm sure it will give you lots of confidence! It's gorgeous and you look fantastic in it! I love the skirt style. I love this dress design, especially for an adult dancer--it doesn't look childish or overly blinged out but it's still beautiful and sophisticated. I hope you have a chance to dance in it soon! Yaay! I grinned when I saw the thumbnail for your post in the list of threads. That's so exciting! There's nothing like getting a confidence boost from dancing in a gorgeous dress. I especially love the shape of the cape; that's what I've been considering if I ever make myself a solo. Aww you look so cute in it, and I strongly request you do your hair for feiseanna exactly the way you have it in your picture. It looks absolutely lovely! You are SUCH an inspiration for me. There are times where, at 25, I feel like I'm just getting too old for all of this, and then I see amazing women like you and know that I've got plenty of fight left! Beautiful! Looks great on you! Thank you so much everyone! It's great to know I am an inspiration. There are days when I wonder about my dancing - of course it would help if I was able to practice a LOT more than I do. As to my hair, I usually do wear a wig - a smaller one that almost looks like it could be my hair if I wasn't jumping around. My real hair, although fine, is heavy and gets disgustingly sweaty if I try to dance with it down and often won't cooperate when I try and style it - the scrunches curl end up frizzy, stringy or just plain flat and I can't straighten it much either. I like not needing to worry about it, just throw on a wig! And yes, that is my son's shoe under the headband - first thing I found to boost it up at 10pm - I was way too tired to do anything "fancy"! That dress is perfect on you. I love it!! !The skirt of the dress is so pretty and I love,love the headband. Good luck dancing in it. It's such a beautiful dress! You're going to love dancing in it, it looks perfect on you. Oh! I'm so happy for you! After such a long wait! You look wonderful in it and I just adore those colors on you. That smile says it all! 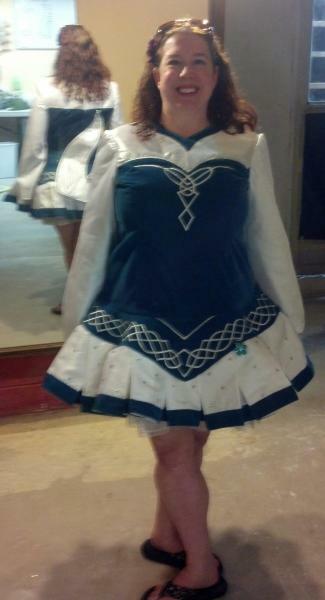 I hope your first feis in your new dress is an awesome one. Hooray! It looks very nice! and I love the bling. A little sparkle, but not overdone, and it definitely adds to the dress. Your dress looks really good with tights too! You look so beautiful in your new dress!!! And I think it's wonderful that you got to a level where you can wear a solo dress! Edited by Kirvin3 (198483) on 2013-08-20 16:11:01 Hit send too soon! You are positively glowing in your new dress! So totally thrilled for you!